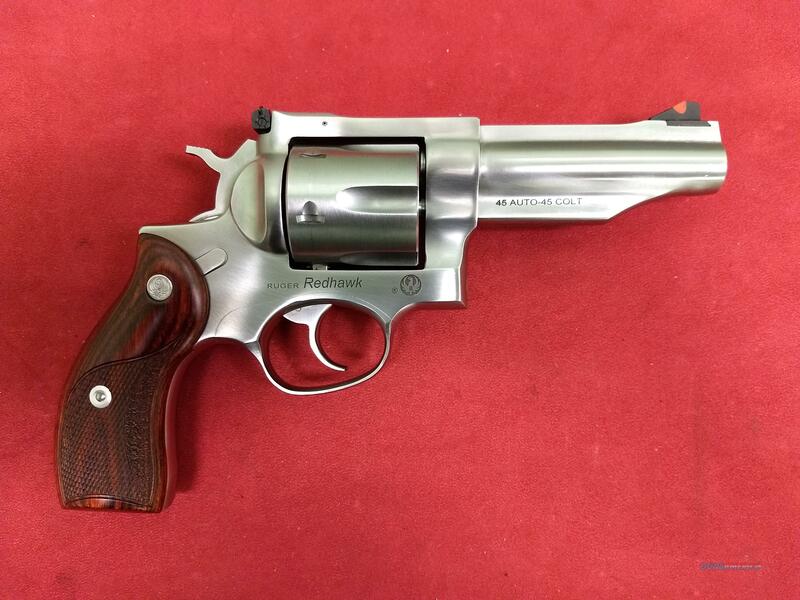 Ruger Redhawk in 45 ACP & 45 Colt, Like New! Description: Ruger Redhawk in 45 ACP & 45 Colt in Like New condition, includes 3 moon clips & factory box and papers. GripsLasered Hardwood Front SightRamp Barrel Length4.20" MaterialStainless Steel Capacity6 Rear SightAdjustable Twist1:16" RH FinishSatin Stainless Overall Length9.50" Weight44 oz. Grooves6 CA ApprovedYes MA Approved & CertifiedYes Suggested Retail$1079.00 Single-spring mechanism allows for a smooth, light trigger pull. Triple-locking cylinder is locked into the frame at the front, rear and bottom for more positive alignment and dependable operation shot after shot. Easy sighting with readily replaceable, colored insert front blade sight and adjustable rear sight with white outline. Rugged stainless steel construction with no side plates, is designed specifically to handle powerful magnum loads through extra metal in top strap, sidewalls and barrel mounting areas. Patented transfer bar mechanism provides an unparalleled measure of security against accidental discharge. Chambered to shoot both .45 Auto and .45 Colt cartridges and ships with three (3) full moon clips that act as both a speed loader for the .45 auto rounds and aid in the ejection of the spent cartridges.